Western Australian music videos are taking over Yagan Square Digital Tower for WA Music Hour. 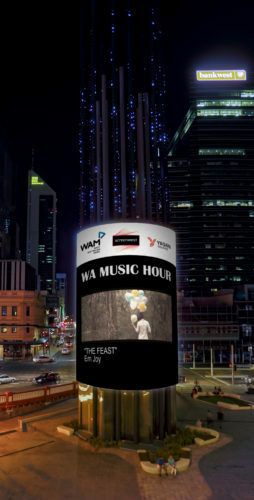 The hour-long WA music video sessions are featuring in the Digital Tower‘s broadcasting schedule to promote music videos from Western Australian artists. Videos from the first rotation were submitted via a community call out and cover a huge variety of genres and original songs, including some artists that have had air play via Triple J Unearthed. WA Music Hour, a collaboration between West Australian Music (WAM), the Metropolitan Redevelopment Authority (MRA) and Screenwest, was designed to highlight local Western Australian talent and celebrate Perth’s thriving music scene. WAM has been collaborating with the MRA since Yagan Square first opened, providing artists at events including Bunuru Welcome and Beats and Bites. It was through this relationship with WAM that the idea for WA Music Hour was hatched. “The MRA is very excited about this opportunity to showcase WA artists on the Digital Tower and look forward to having this as part of our regular programming,” said Caryn Earnshaw, MRA Place Activation Manager for Perth City Link. The first WA Music Hour occurred on Friday 27 April to great success with the featured artists delighted to see their music videos on the Tower. Check out the schedule below to see when the next WA Music Hour is on. If you’re interested in participating in a future WA Music Hour, please contact Screenwest Content Programmer and Producer Alana Swift at alana.swift@screenwest.com.au. Share your photos using the hashtag #WAMusicHour.